UPDATE: Thanks to everyone who came out in support of Paris Gore’s gallery on May 8th. The entire collection will be on display from now until the end of May, so don’t miss your chance to see these awesome mountain bike images up close! 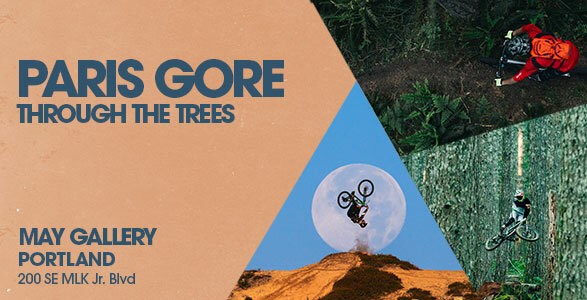 By Chris Shalbot, Seattle, WA: It’s with great pleasure that evo brings you Through the Trees, a selection of work by action sports photographer Paris Gore, showcasing his passion for the outdoors and love of life on two wheels in our Portland store this May. The collection of mountain bike and amazing scenery has been on display in Seattle since April 11th (check out the recap here)and will make its way to Portland where another opening event will occur on May 8th drawing the community together to raise awareness and support for local trail building via donations at the bar. Based in Bellingham, Washington, Paris graduated from the Commercial Photography Program at Seattle Central and has pursued his passion of documenting the characters and culture of mountain biking. First as a rider, then as a photographer, Paris has long studied the interplay of movement, light and landscape in the mountains. From behind the lens, he translates those stories for his audience through images crisp with authenticity. His work is routinely featured in major publications and commercial ad campaigns. Shooting a wide variety of disciplines, Paris’ work grasps the raw emotion in World Cup downhill racing to big mountain freeriding, trail riding and dirt jumping. His work has earned top steps at contests such as second place at the 2014 Crankworx Deep Summer Photo Challenge and Top 250 in the 2013 Red Bull Illume Photo Quest.